Behind a pair of goals from T.T. Cianfarano and a shutout from goalie Chelsea Laden, Quinnipiac women’s ice hockey beat the Maine Black Bears 4-0 on Friday afternoon at High Point Solutions Arena. 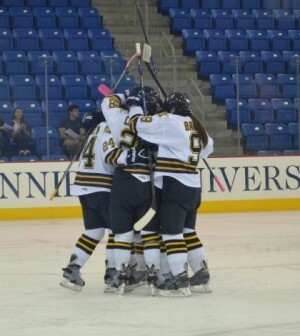 Quinnipiac head coach Rick Seeley was pleased with his team’s bounce-back performance. The Bobcats tied Penn State 1-1 last Sunday. Cianfarano’s first goal came 5:33 into the first period, as she found the back of the net of a Morgan Fritz-Ward pass to give the Bobcats an early 1-0 advantage. The freshman leads the team with four goals in four games thus far. Cianfarano’s scored again off a rebound after Nicole Connery’s shot was blocked on a two-on-one breakaway, making it 2-0 Bobcats. And for Cianfarano, it’s the first multi-goal game of her young career. “It’s definitely a special moment, but without the linesman contributing, it wouldn’t have happened,” Cianfarano said. She added that she follows the lead of some of the team’s older players, whom have helped her so far early in her collegiate career. Emma Woods and co-captain Erica Uden Johannson each scored a goal in the second period to put the Bobcats up 4-0. Chelsea Laden had 13 saves in the win. She has not allowed a goal in three games so far this season, and currently ranks first in the NCAA in save percentage and goals allowed. With the win, Quinnipiac improves to 3-0-1 on the season. The Bobcats look to build on the win in a rematch with Maine at High Point Solutions Arena at 2 p.m. Saturday afternoon.